Add washer fluid in the following situations. ● Any washer does not work. ● The low washer fluid warning light comes on. 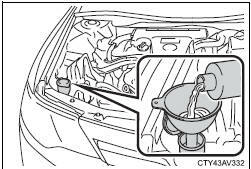 ■When adding washer fluid Do not add washer fluid when the engine is hot or running as washer fluid contains alcohol and may catch fire if spilled on the engine etc. ■Do not use any fluid other than washer fluid Do not use soapy water or engine antifreeze instead of washer fluid. ■Diluting washer fluid Dilute washer fluid with water as necessary.